If you're looking for an international escape but want to keep your passport at home, consider planning a vacation to Miami. The worldly city is located on Florida's southeastern tip. Its Cuban influence is reflected in the cafes and cigar shops that line Calle Ocho in Little Havana. 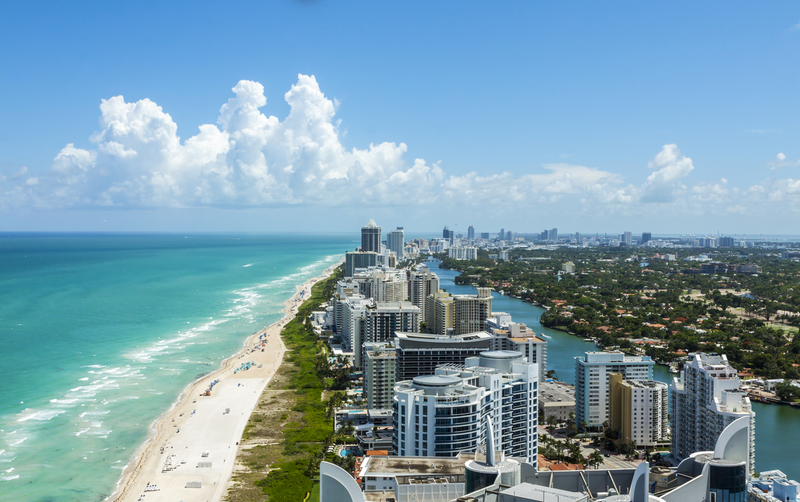 On barrier islands across the turquoise waters of Biscayne Bay is Miami Beach, home to South Beach. This glitzy neighborhood is famed for its colorful art deco buildings, white sand, surfside hotels and trendsetting nightclubs. Glamour aside, the city has plenty of quality restaurants, bars and attractions to appease any budget traveler. It's more doable than you think. According to travel site Skyscanner, there are plenty of flights from New York City to Miami in the next few months, and the prices aren't too shabby. Currently, the cheapest flights between New York City and Miami are if you leave on December 1 and return from Florida on December 5. American Airlines currently has tickets for $101, roundtrip. There are also deals to be had in November. If you fly out of New York City on November 19 and return from Miami on November 22, Frontier Airlines can get you there and back for $103 roundtrip. To plan your stay, here are some of Miami's top-rated hotels, according to Skyscanner, that we selected based on price, proximity to things to do, and customer satisfaction. The Fontainebleau Miami Beach overlooks the Atlantic Ocean and stands three miles from South Beach and the Lincoln Road shops. Miami has plenty of topnotch dining options. Here are two of the most popular, according to Skyscanner. "Food and service were first class," visitor Shane wrote. "We've lived in Miami for two years and always felt Joe's was a place for tourists but it's so much more than that." Not sure what to do in Miami, besides eat and drink? Here are a few recommendations, provided by Skyscanner. Visit Vizcaya Museum and Gardens, the villa that Queen Elizabeth and Pope John Paul II have visited in the past. You can spend hours walking through the gardens and taking pictures at the reflecting pools. Since its grand opening on December 31, 1999, the American Airlines Arena has become one of the nations's premier facilities in sports and entertainment.